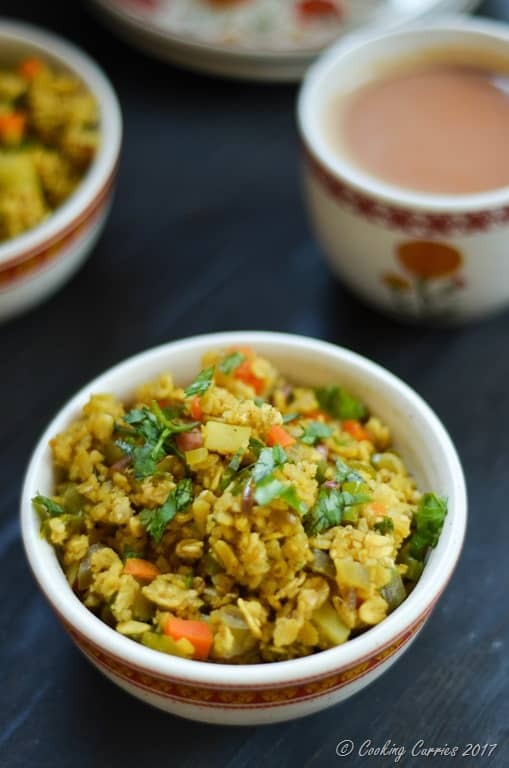 The traditional poha with flattened rice, transformed into a power packed bowl with oatmeal and lots of veggies, to help you start your day right! Indian food, however diverse it is, is also a lot similar in many ways. Every region has its own version of any kind of dish. Like for instance, there is a dal / lentil curry for every region of the country. There is a potato curry for every region, that is still a potato curry but ever so slightly different with some inclusion or exclusion of certain spices or other components to it. This poha is also something like that. 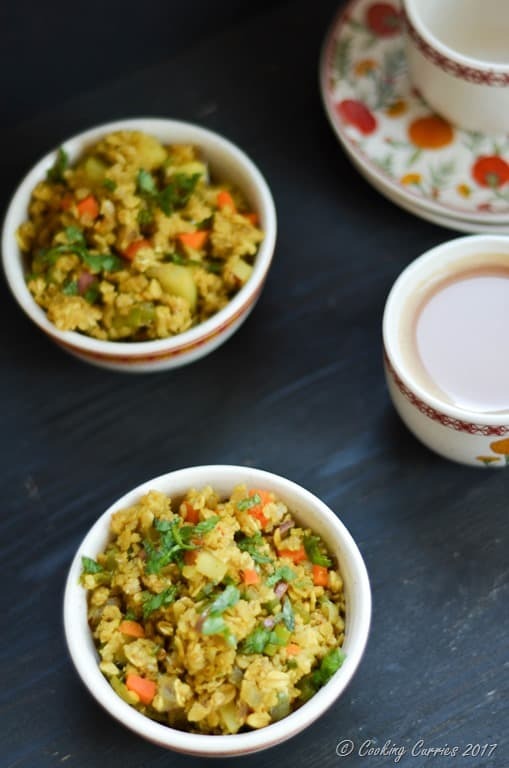 It’s a staple Maharastrian (from the Western state of Maharashtra) breakfast that is made like a loose porridge or sauté of flattened rice and either potatoes or onions, the former called batata poha and the latter called kanda poha. The Southern Indian version of it is an Upma, which is also a breakfast porridge but is usually made with semolina (Rava Upma) or vermicelli (Semiya Upma). There is an upma made with pohas as well, called Aval Upma. So, there you go, its all different but its all the same too! If you need something a little different, you can try this bread upma too! 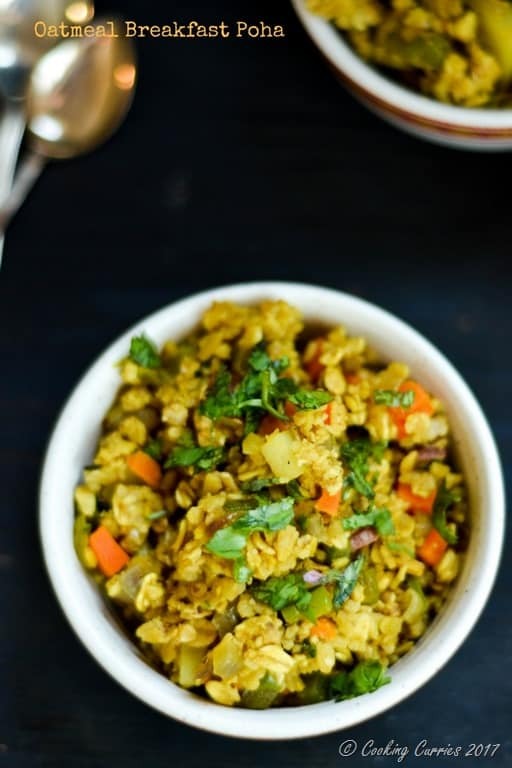 I have switched up the all flattened rice in this recipe for half flattened rice and half oatmeal and a lot more veggies in this to give my touch to this favorite Indian recipe. If you are unable to find poha, you use just oatmeal too. Heat the oil in a deep pan and add the mustard seeds to it. Once they crackle, add the curry leaves and the onion, chillies, turmeric powder, carrots, potato and green bell pepper. Lower the heat and cover and cook till the potatoes are almost cooked. Add the oatmeal and poha, sprinkle a little water and cover and cook for a couple of minutes. Add salt and mix well. Once the poha is also cooked, remove from heat, squeeze the lime and garnish with cilantro. 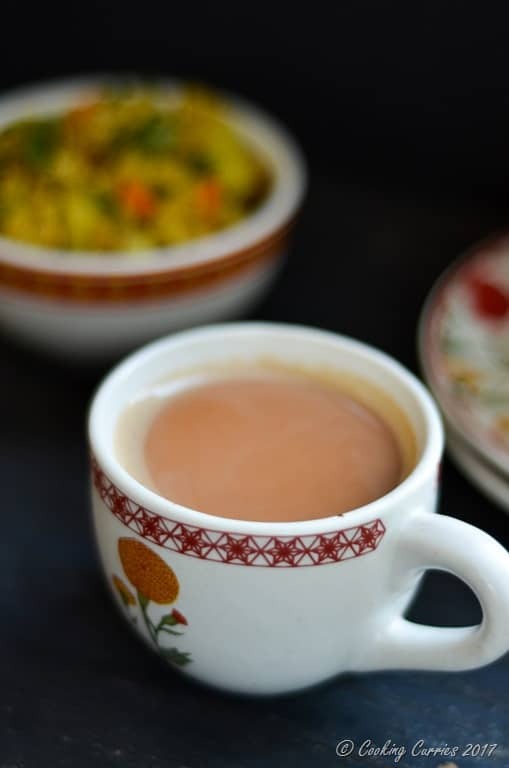 Serve hot with a cup of hot chai. That looks like a great savory breakfast bowl! A must try oatmeal! Thank you! And savory oatmeal for a change of scenery ? I’ve never heard of this before. It looks gorgeous, although I would prefer to eat it later in the day. I would have thought this was a side dish or entree with those flavors and how savory it looks. I’m going to have to try it one day. I love savory breakfast recipes. This looks delicious, Manju! Yum! I’m always looking for new breakfast ideas and this is one that would have never crossed my mind. I can’t wait to give it a try! Thanks for sharing!